1 Heat half the oil in a large frying pan and cook the onions for 12-15 minutes on medium heat until golden brown. Remove onions and set aside. 2 In the same frying pan heat remaining oil add the beef and cook on medium heat for 10-12 minutes, stirring regularly until meat is browned on all sides. Add celery. 3 Add the onions back to the pan and pour in the ale. Bring to the boil and simmer on medium heat for 15-20 minutes until the liquid has reduced by half. 4 Add the Knorr Beef Stock and bring to the boil then reduce to a simmer. Mix in the diluted cornflour and pour over the meat, stirring well. 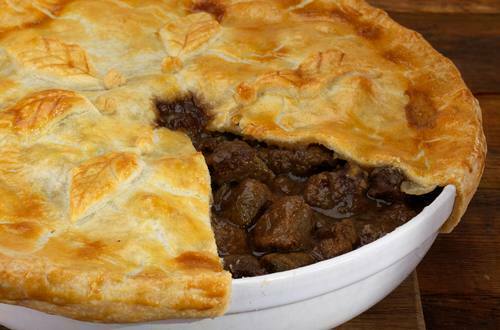 5 Place the meat into a pie dish, cover and cook in preheated oven 160°C, 140°C fan, Gas Mark 3 for 1½ - 2 hours until the meat is tender. Allow to cool. 6 Roll out the pastry to approximately 3mm thick and brush egg around the top edge of a large pie dish. Cover with the rolled out pastry and press down firmly to seal the pie. Brush with egg and bake in oven 190°C, 170°C fan, Gas Mark 5 for 30 minutes.